It is late afternoon and there is not much wind up here but we are exhausted from the climb and must start down soon. There is always a temptation to linger in such places as long as possible. 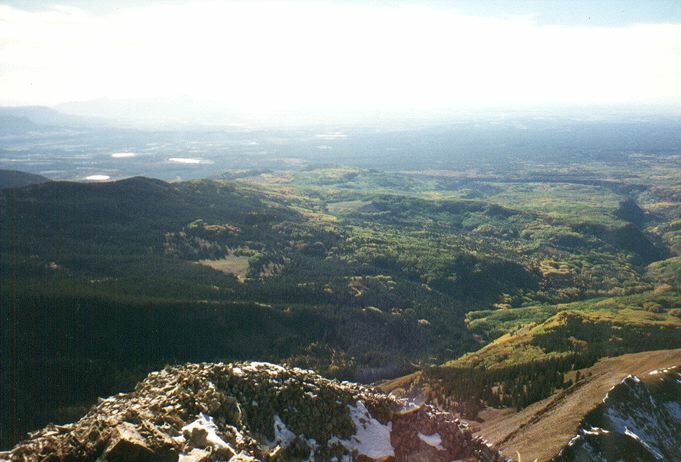 Hesperus commands a view that drops 7000 feet into the San Juan Basin. Aspens on the upper slopes are starting to turn golden. The dark groove on the right is the Mancos River, which joins with the San Juan River near Four Corners, about 50 miles over the horizon. Mesa Verde is in the hills to the upper left. Our camp is located in a grove of trees down in that dark valley to the lower left.